First calf of the season. 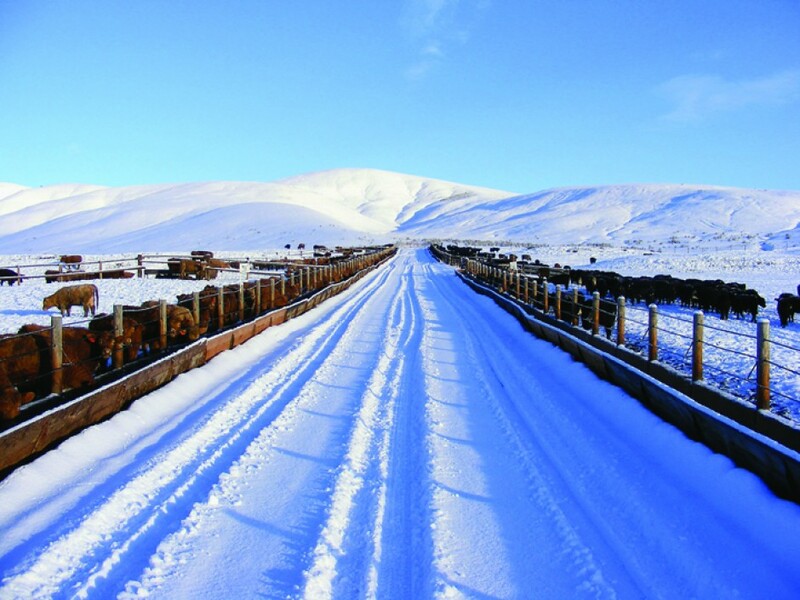 We’ve had calves born in snow, rain and wind this year, but fortunately the weather has been getting warmer again. What does calving season have to do with slow cooker meals? Well, seeing as 2 to 3 baby calves are coming each day, having a slow cooker meal ready for dinner makes at least one part of the day a little easier. Not only is my hubby busy checking for baby calves each day and night, but we’re also still feeding cows as the grass is getting greener, but not yet tall enough to provide all the nutrition the cows need right now. 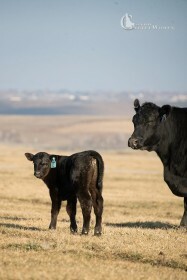 Our bull sale is a little over a month away. 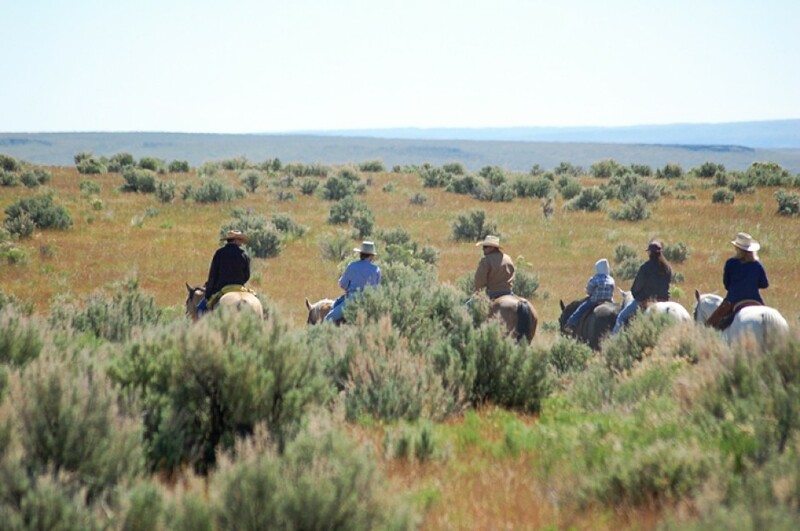 Many other ranchers who produce seedstock or purebred cattle, are also prepping for the bull sale season. This is when commercial producers purchase their bulls to use for the next breeding season. We’ve been gathering the pedigree information and taking photos for the catalog, putting together advertising, and going through the checklist of must-dos before sale day. 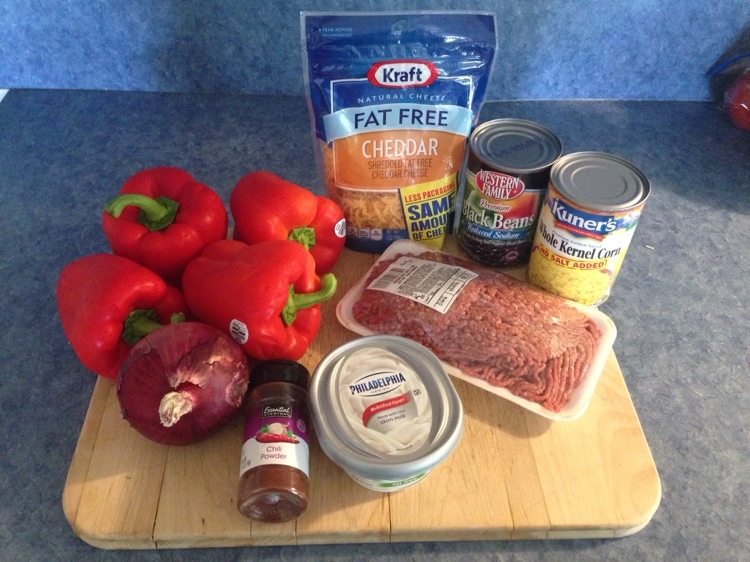 All the Hamburger (Ground Beef) Stew ingredients combined into my slow cooker. Kids’ activities keep us on the go as we have one playing basketball and one in wrestling right now. Not to mention homework sessions each night. Our busy days and evenings give me reason enough to keep the Crock-Pot® filled. Dinner is much easier when I plan ahead and spend a few minutes prepping in the morning while cleaning up breakfast dishes. I love slow cooker meals because they are little mess and provide a healthy, hearty meal for my family at the end of the day. I guess the only downside for me is smelling the yummy goodness all day long and it makes me hungry, ha! I tried several new beef recipes during the holidays and this new year, so I’ll be sharing them with you here. This one isn’t a new one, but actually a tried and true recipe from my mom—it always reminds me of home. Not only is it easy to make, but it’s become one of my kids’ favorite meals too. I’ve included some helpful hints as well. 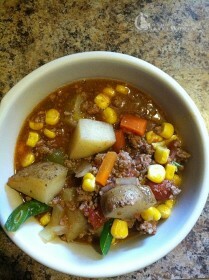 A yummy bowl of Hamburger (Ground beef) Stew. A perfect end to a busy day—easy, hearty and healthy! 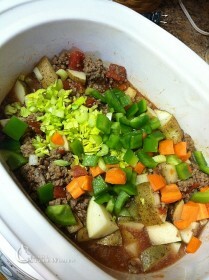 1-2 pounds lean ground beef (Brown and cook thoroughly. Drain and rinse with water if necessary to remove extra fat if not using lean ground beef.) *Helpful Hint: Buy ground beef in bulk and brown all at once, divide into 2-4 cup servings, and place in freezer gallon bags. 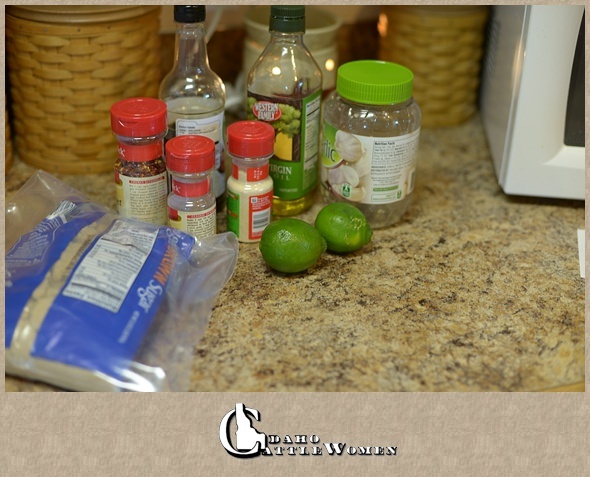 It makes it super easy to prepare a slow cooker meal or a quick dish when some of the prep is already done. *Helpful Hint: I fill the empty tomato can with water to add liquid to the stew. You can also use one can of beef or vegetable broth. 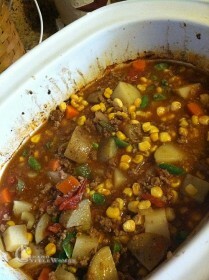 Put all the ingredients in slow cooker and cook on high 4-6 hours or low for 8-10 hours. I love to serve with Beer Bread or crusty rolls to sop up some of the broth, but truly it’s excellent all by itself. *Helpful Hint: This recipe is easily doubled or tripled, depending on how many you need to feed. It also freezes well, and makes a great meal to take to neighbors or friends. For all those busy nights when you don’t want to worry about dinner, I hope you consider this easy, hearty and healthy hamburger, ground beef stew! Disclaimer: This post is not sponsored by Crock-Pot®, Lawry’s or Mrs. Dash, but we wanted to give credit to these brands as they were mentioned in the post. 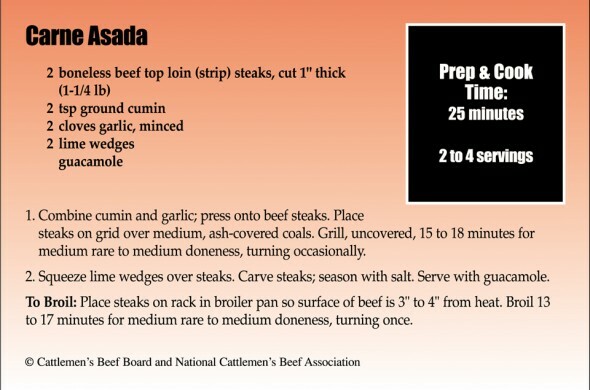 With Labor Day quickly approaching, we thought we’d share another beef recipe. 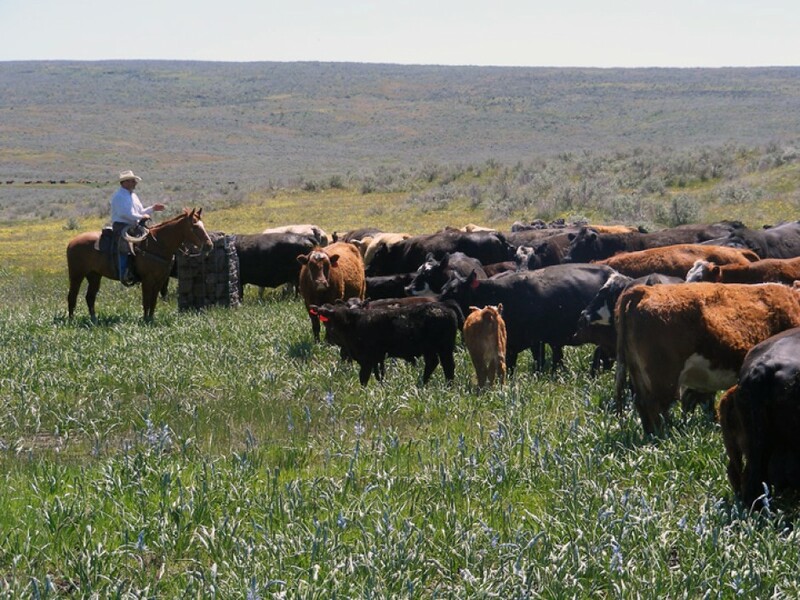 And rest assured, Idaho’s ranching and cattle feeding families are always working hard to bring you healthy and delicious beef for you to enjoy! 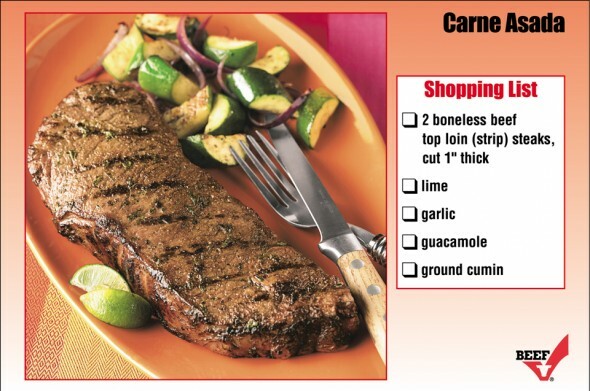 Here is a quick and easy carne asada recipe. 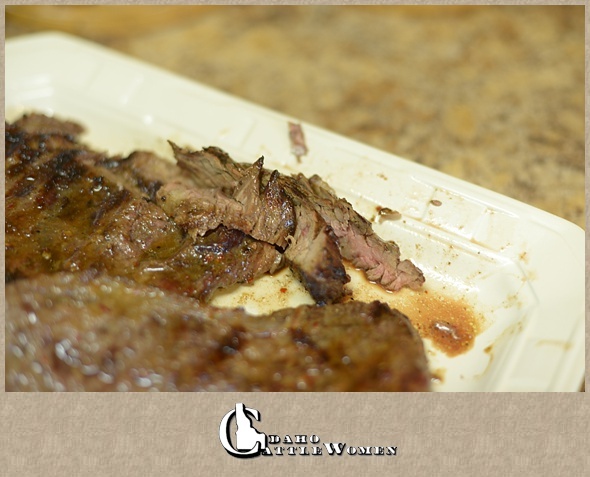 We love how simple it is and lets the wonderful taste of beef shine through. Cumin gives it a smoky flavor and who can argue with the combo of garlic and lime?! This is really versatile too and can be used with any cut for grilling. Slice it thin and serve over rice or in a homemade tortilla. Wishing you a Happy and Safe Labor Day Weekend! There are two life lessons my parents started teaching me at a very young age. The first was how not to throw like a girl; the second was to evaluate the facts and come to a decision on my own. That lesson of open-mindedness has allowed me, on several occasions, to be an informed rather than ignorant participant in discussions. This has come in handy working for an industry with so much opposition to the way cattle are raised and the nutrition of beef. 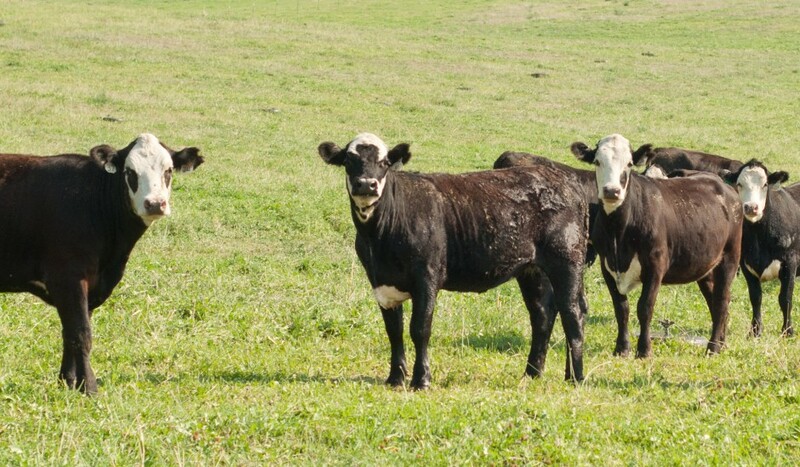 Spending my days advocating for the beef community, it’s easy to know our facts. 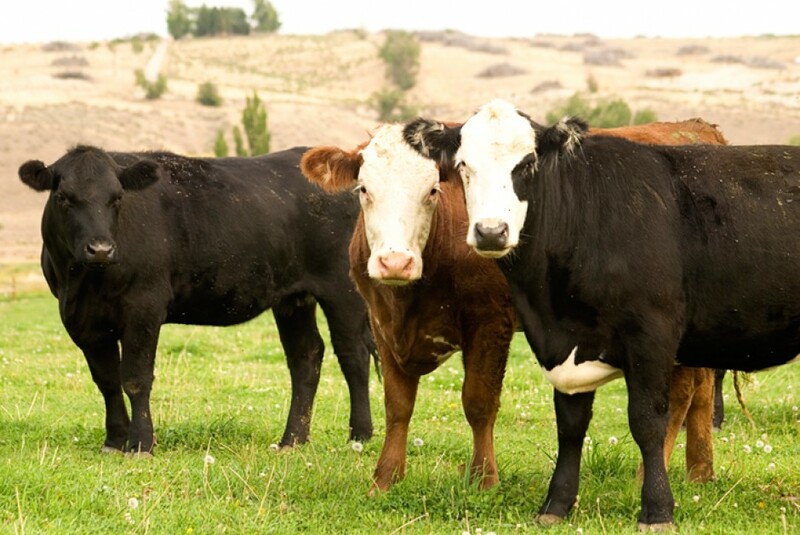 Cattle producers are the original stewards of the environment. 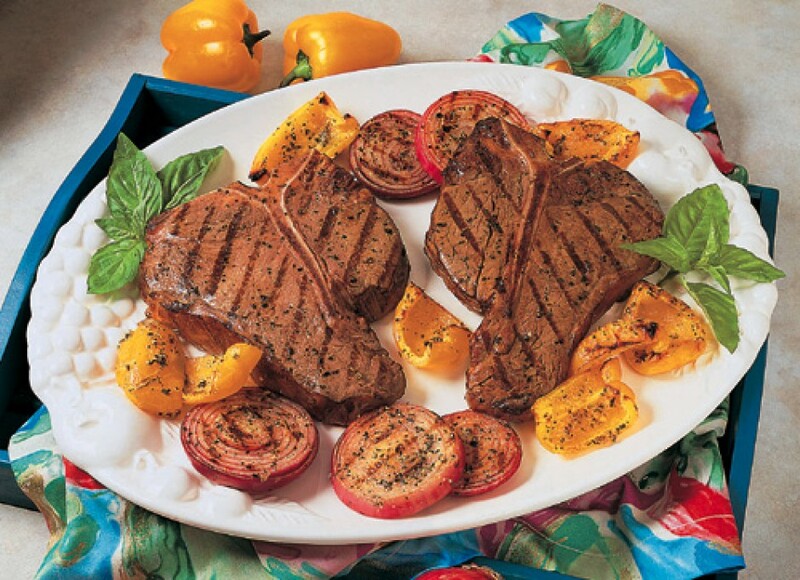 Beef is an excellent source of ten essential nutrients. Already unable to eat dairy products, I eliminated all animal protein from my diet. 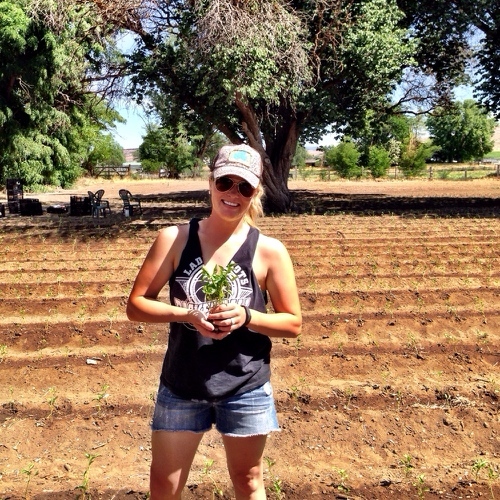 I became a vegan—at least as far as food consumption goes. I replaced my scrambled eggs and fresh fruit breakfast for vegan protein powder mixed with almond milk. I bought the Forks over Knives cookbook and traded in my extra lean ground beef for quinoa and lettuce. For a full month, I tracked calories and recommended daily values, while I ate my way through fruits and vegetables, trying to find ways to replace the protein and nutrients I was avoiding from meat with raw alternatives. Just a couple of weeks ago, I had a conversation with a friend of mine who fancies himself a triathlete. He made a comment about how “meat is gross,” and I promptly started in on what he would certainly call a rampage about all the health benefits of beef, especially for athletes. Phosphorus, which builds strong bones. Riboflavin, which converts food into fuel. Iron allows the body to use oxygen appropriately. 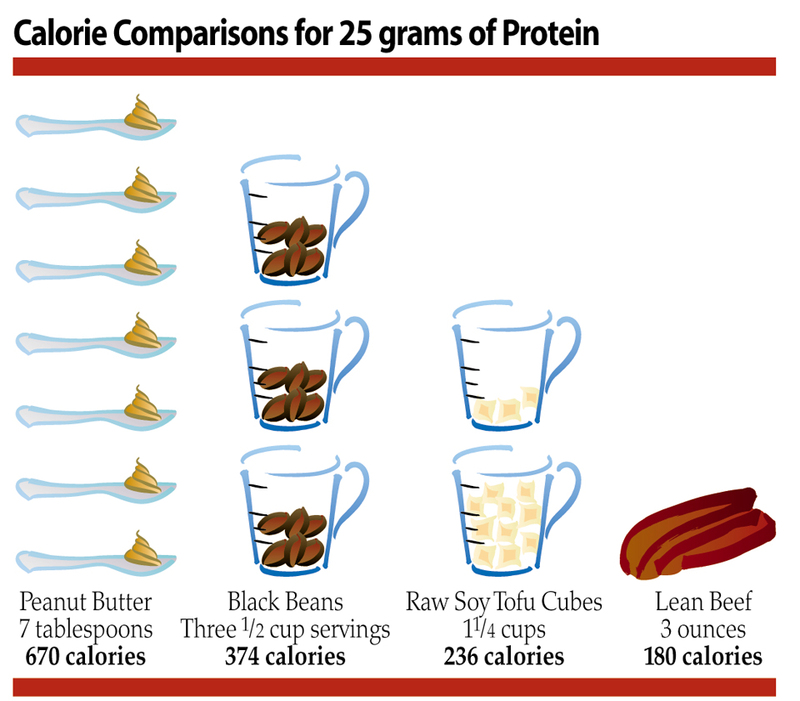 And 48 percent of the daily value of protein comes from just three ounces of beef. Let’s not forget protein preserves and builds muscle. All of these seem pretty important for someone who is planning to swim 1.5 kilometers, bike 40, and run 10 in the Spudman Triathlon. Of course, his response to my education was, “They pay you to say that.” And I replied by telling him of my Meatless March experiment and outlined for him exactly what it did to my body. The first couple of days I had to remind myself I wasn’t eating animal proteins. I loaded extra vegetables on my spinach salad and ate my way through a few handfuls of mixed nuts. By the end of the first week, I was craving the nutrients I was lacking. A tablespoon of peanut butter was certainly no substitute for steak. During the next two weeks, I noticed definite physical changes. The pink in my cheeks was replaced with pallor, and I developed alarming dark circles under my eyes. I was sleeping poorly, was irritable, cranky and exhausted. Workout recovery time lengthened and stamina decreased, and by the end of the fourth week I had gained seven pounds. Yes, I do get to spend my days promoting cattle production and beef consumption, but I wouldn’t do it if I didn’t believe in it. I may have cousins and friends who choose not to eat meat, but I know they would feel a lot better if they did. 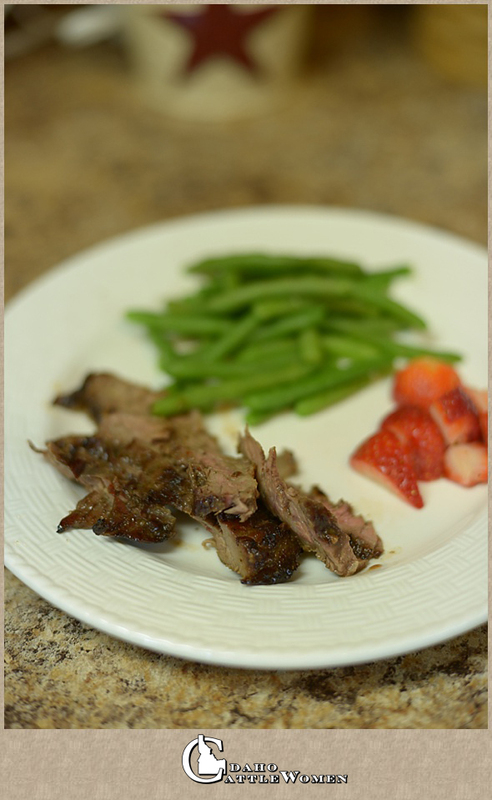 Incorporating beef as a regular part of your diet provides you with better energy for an active lifestyle. It also reduces your risk of injury by strengthening bones and building muscle, and helps protect cells from damage. 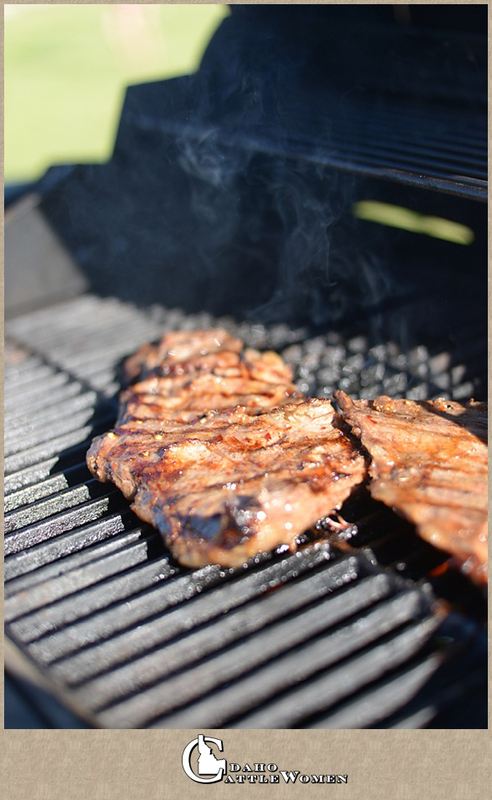 Beef supports nervous system development, improves brain function, and helps maintain a healthy immune system. Workouts are more effective when fueled by a higher-protein diet. 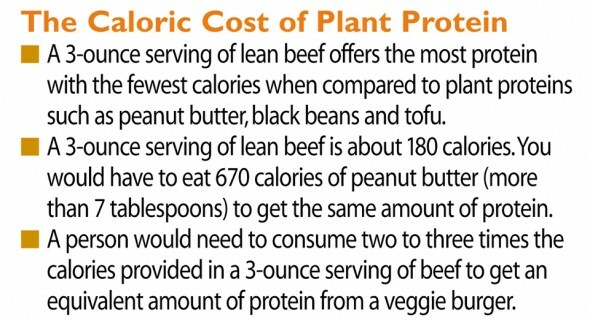 Beef makes a difference! 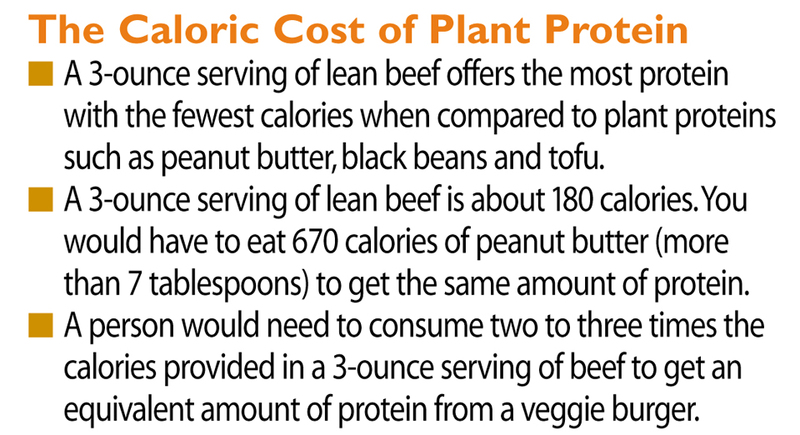 For more nutritional information about beef, check out these Beef Nutrition facts or check out this pdf ProteinsAreNotCreatedEqual. I’ve always been fascinated about nutrition, specifically the relationship between what you put into your body and what you get out of it, and this experiment illustrated to me that while fruits and vegetables taste great and are good for you, they simply aren’t enough. Beans and broccoli and almonds just can’t provide the nutrients beef can for the same caloric intake, and your body—regardless of your physical activity—needs those nutrients to function properly at optimal levels. That’s what Meatless March taught me. Beef fuels me. 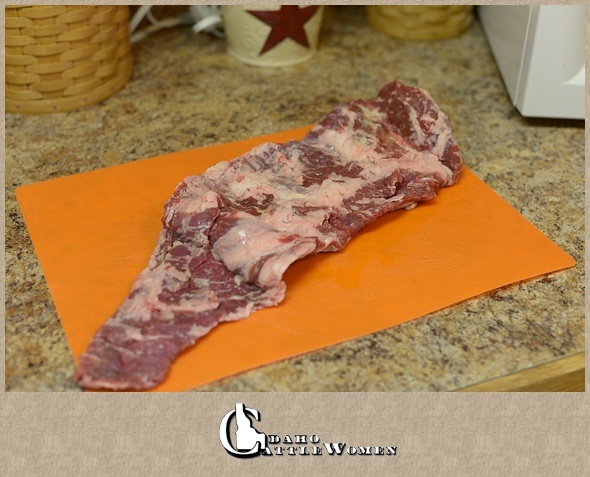 This is what the skirt steak looks like. I usually slice it in two pieces. It makes it easier to fit in the plastic bag to marinate and it fits on the grill better. In the essence of full disclosure, we have a freezer full of beef, so I don’t have to buy meat at the store. I do, however, enjoy looking through the meat counter to see what they are offering. I did look at one of the local groceries this week and skirt steak was selling for $6.98/lb. I saw packages ranging from .87 lb. to 1.28 lbs. Two pounds of meat easily feeds our family of six. 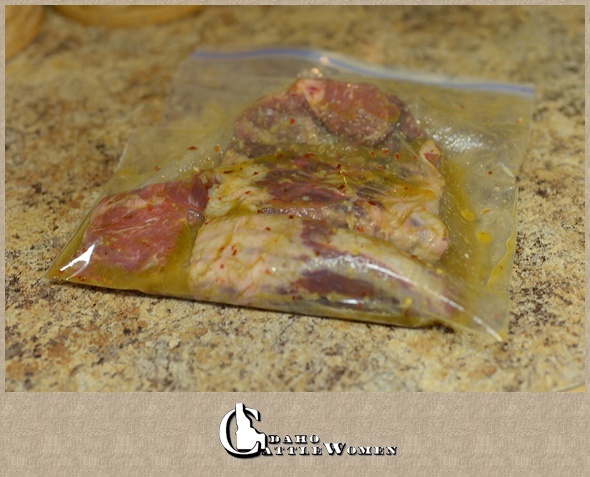 After meat is split, I drop it into a large plastic baggie then pour in the marinade. I close it up tightly to get all the air out, move the bag around to coat all the meat, then place it on a plate in my fridge to marinate. I usually marinate meat either all day and sometimes overnight. I try to plan meals so that I thaw meat first thing in the morning, then it can marinate in the fridge during the day so we can cook it that night. Sometimes I’ll prep a few meat dishes at the same time then all I have to do is grab them from the fridge each night and they are ready to cook. This recipe said to marinate at least one hour. If the meat is browned properly on both sides, but not quite cooked enough in the middle, I’ll place it to the side and shut off one burner then close the lid to let it cook a little longer. Once it’s ready (we like our meat medium to medium rare), I’ll take it off grill and let it rest on a platter so juices can redistribute. Then I slice it thinly and against the grain of the meat. (If the meat gets long and stringy, chances are you’re cutting with the grain.) Now you’re ready to enjoy! 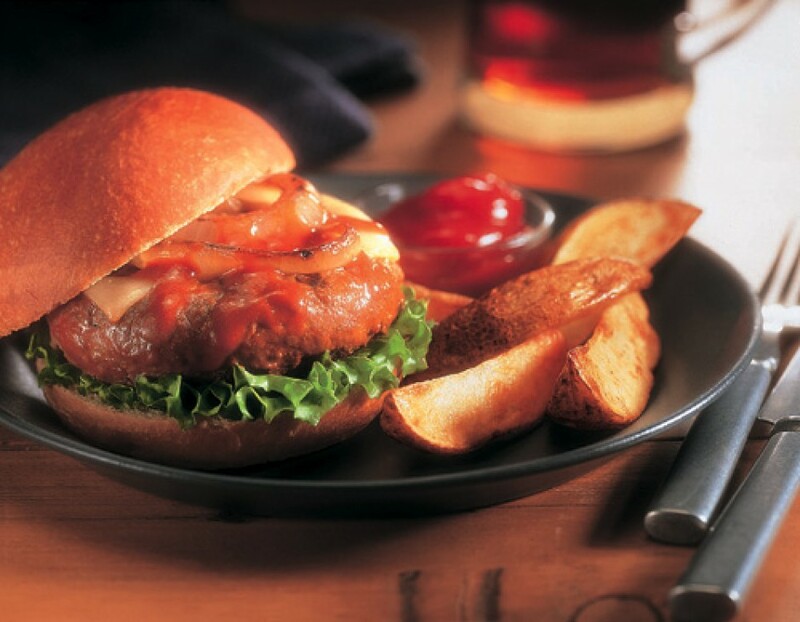 I hope you try this recipe and enjoy! We found the original recipe here at this link, and we adapted from it. 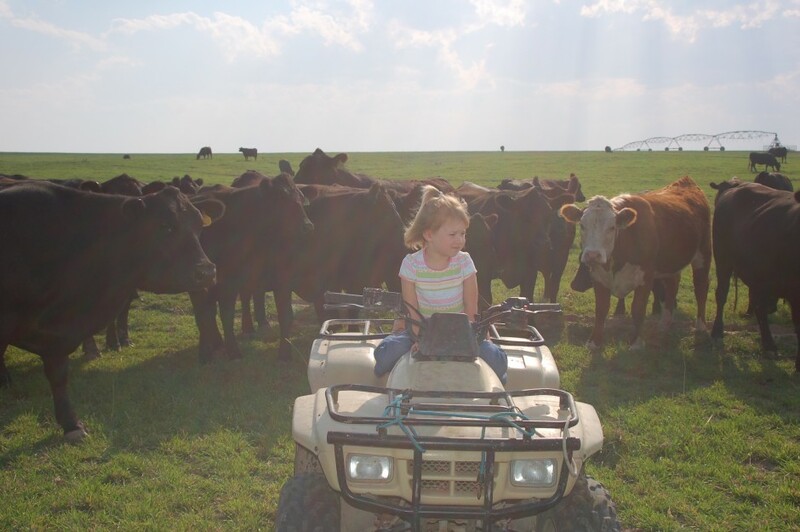 From our ranch to you, we wish you a fun weekend! I’m the kind of person who thinks that everybody has something that they “nerd out” about. You know, the thing people have that deep, fiery passion for, and will never be able to learn enough about. For some it’s a general topic, such as sports; for others it’s something much more specific, like knowing every possible factoid about Abe Lincoln. I have a few different subjects I enjoy learning about, one of which is agriculture…what a surprise 🙂 I find it absolutely fascinating that I’ve been in the ag industry for 24 years and STILL have crops or animals that I know hardly anything about! Dairies, flower farms, orchards, wineries…you name it, I want to tour and learn more about it! Earlier this week, I got to do just that! All of our work at home was caught up, so we spent the morning helping some friends, T&C, plant bell peppers starts, by hand! There are implements that can do a majority of the work, but in this field, a tractor would have done more harm than good. In the three hours we were there, we managed to plant more than 2,000 starts! When these little guys start producing, T&C will sell them to smaller markets in the Treasure Valley. They expect to yield an average of 5 peppers off each plant, although others in the area have seen as many as 8-10. 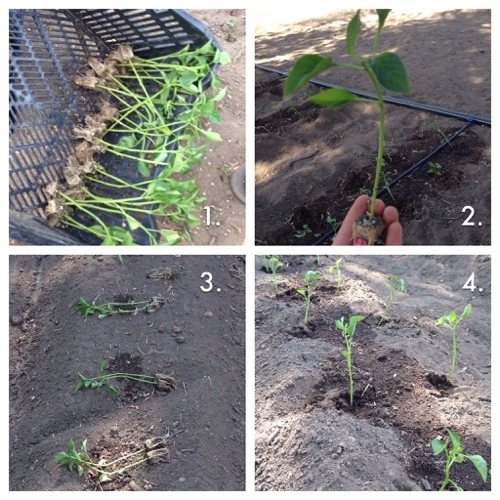 1) First, we sorted good starts from bad starts, making sure that only healthy starts get planted. Here you can see some of the starts that made the cut. 2) An up-close shot of a pepper, before planting. 3) One person walks ahead of the planter, dropping two starts down. An underground drip line will water these for the duration of the summer. 4) The finished project! So how is this related to cattle? A recipe, of course! 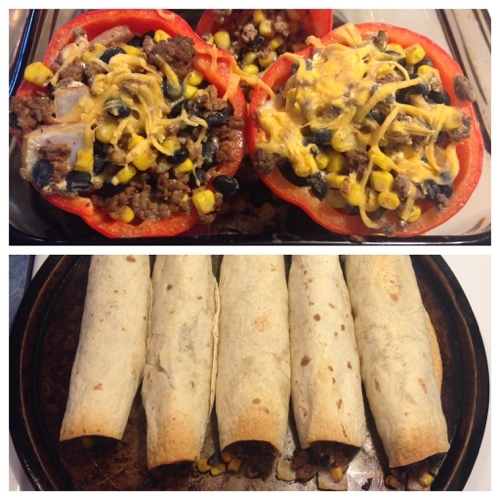 I’ve been dying to make some beef-stuffed bell peppers, so this gave me the perfect excuse! 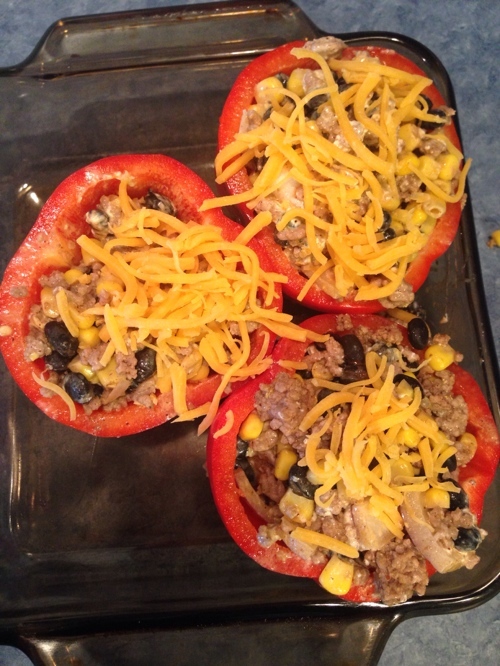 Even thought they have a short list of ingredients, these stuffed peppers are packed with taste! In a skillet, add the ground beef and cook thoroughly. Be sure to drain any grease during this process. 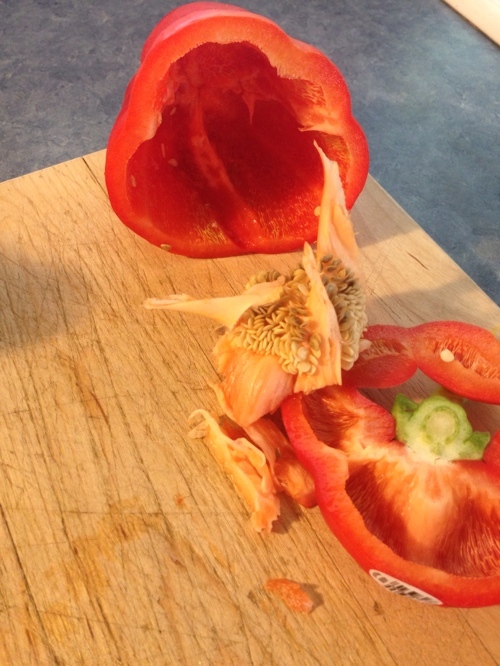 While your beef is cooking, take a moment to cut the top of your peppers off, spoon out what’s inside, and rinse them out. 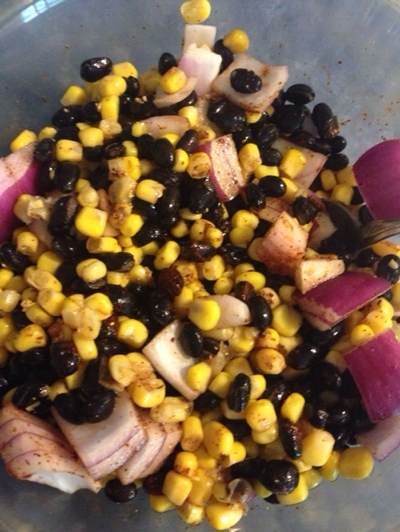 Next, add the corn, black beans, onion, and chili powder to a separate bowl. 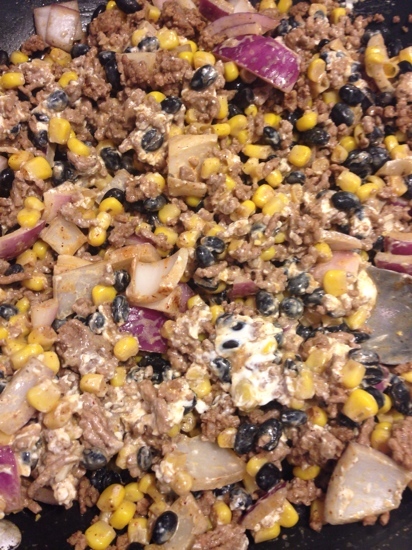 Once beef is fully cooked, add the corn/bean/onion mixture to the skillet. Next, add the cream cheese, mixing with the other ingredients until melted. Now it’s time to fill the peppers, topping them off with shredded cheese! Because I only ended up having 3 peppers, I had lots of filling leftover. Instead of letting it go to waste, I grabbed some tortillas, spooned the filling inside, rolled them up, and placed them on their own cookie sheet. I put both dishes in the oven, cooking them for 15 minutes. Yummy! You could top with sour cream and a garnish of chopped cilantro if you’d like, or just enjoy as is. They were delicious. Enjoy!